No conflict with my Line6 UX2, on the contrary, all my model packs are automatically added to the effects available in POD Record. Assistance directly accessed through the software is in English but unfortunately the French textbook is available and the many video tutorials fairly simple to understand. I have a small rise in config Pentium E2200 (dual core 2.2 GHz) and 4GB of Ram. No major concerns although I find that the gauge rises faster CPU than Cubase for instance. It seems very stable against, no crash this time and all goes well in handling. I won! I often "ogled" this software since its release (and even before, I could be "beta tester" for a few weeks before its release). I did not have the means to acquire it, already having a poor Cubase Essential 4. And then I was able to seize on sale for € 75 (woohoo!) and I did not hesitate. Warning, this is not a software "easy" at first, especially for users of traditional DAW. But very (VERY) fast we capture the logic and it is ultimately very easy to use and you get to work quickly with! Regulars of Reason, themselves, will not be too disoriented. Of course, there are many things that will not include the inability to use the VST. But ergonomics is so great, the possibility to route all elements of the racks, to combine multiple effects as you want through the Combinator and especially and above all: the console! This is the real stroke of the heart of this software for me. I do not know the other emulations of SSL slices but the fact is that I enjoy fiddling with that of Record. And gradually we realize that for this part there at least every other VST are relatively unnecessary. Everything is here, the input gain (perfect for recording up a bit weak) to pan through the comp (very nice), the gate eq (hummm!) Inserts and departures ... short as in real. AND as a bonus: the master bus compressor that many know and covet. Again I do not know other emulators (SSL Waves, Duende and other Native Instrument) but it is a feast for the eyes and especially ears! Here there is no preset, no, nowhere, which can destabilize shocked to see that just Cubase, filled with sounds pre chewed. But it is also that force: up to listening and ear, more than manipulating gadgets and other visuals. I still keep Cubase, particularly for use as a VST host (including my beloved EZDrummer) and placed in Record Rewire. But I begin to import all my songs and remixing in Record. A must! 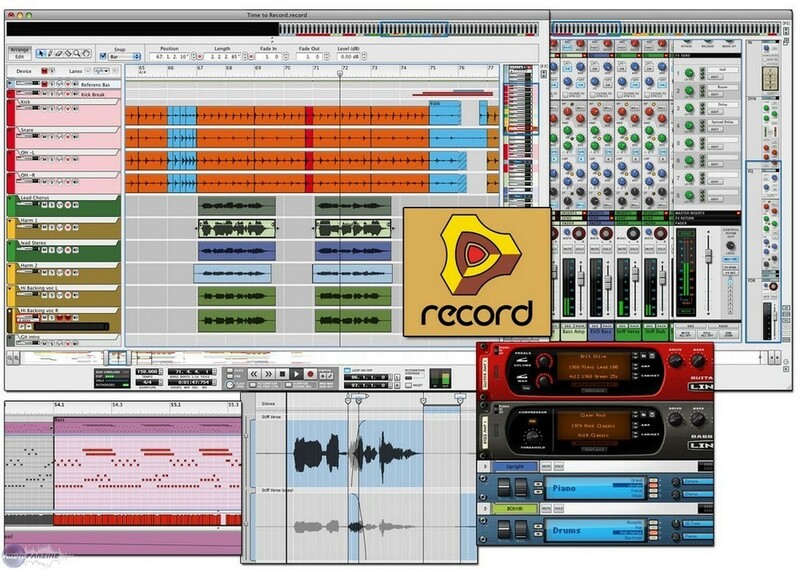 In addition I now have the ability to upgrade to Reason 6 which now includes Record for 149 €. Geez, I have a couple of pennies for that. Le d's review (This content has been automatically translated from French)" Good, good, strong!" * General config good, easy, almost everything is automated. all that is asked, with clear tutorials, the icing on the cake. Boosted comp triple core, 3GB ram, dedicated sound card, then something very powerful. it hold the road, easily, without pain, or heat almost. I'm surprised not to have (yet) felt out of breath, limitations on this software. EDIT: I've felt the limits of the software, you still have to really load the projects, or use lots of different cuts, or guitar amp / bass at a time ... ie c is not every day that it happens, it is really wanting. triple display, visual comfort of use, the power (because there are people to manage), the sereinité, stability, all Effe, possible arrangements (c is crazy! ), the quality of the mix, the multiplicity of mixing and especially the final rendering al export! the inovation that brings the software in the world computer music. all possible choices of export! the approach of the software for composing, which is innovating! getting started at the beginning, different from Reason A different way to deal with computer music (comparing to all the software!) but sy is fast, especially when there's matches at your fingertips. wiring really do, in fact ..
to conclude: j applauded the 2 hands! Easy installation, easy to configure ... well presented manual. Yes solid stability as usual in Prop. any trouble from the software. This software has been a mini revolution for me, everything is designed so that productivity is maximized. I would even call record, especially when it is associated with Reason (Reason pack + Record) real gas plant music! When you combined these two brothers we go for the cardboard! A good sound card, microphone nearby, a midi keyboard, electric guitar and HOP! Record provides everything that was lacking in Reason, you can record audio tracks, play guitar or bass and add a virtual amp Line6 which sounds great, correct tracks, add beats with Reason (a drum track for example) and everything goes very quickly without complications unlike so many other well known software. Record follows the finger to the eye and even seems to give you nudges with multiple functions that are practical (guitar tuner built-correction tracks, audio preview of the note in MIDI, MIDI editing easy ...). That's the pleasure of recording! From the moment you insert the key, it's like if you thinned a sports car, you have power at your fingertips and the ability to go very fast in your work. All without talking about the finished party mix that make the sound "pro" provided you have very good knowledge in the field. In short, every home studio, I could only recommend. And the price we do not review at this level is more than an investment. All I regret is not being able to add VST Record, Prop. 'reserves excluding its chain of software but at least it works to hell, a little like what Mac. No problem at this point compatibility. Uh .. the manual? wait ... I remember well .... But the little videos on their sites offer an easy ride. the config is stable in xp 32. I tried both vista 64 and I had a crash, I did not look further. I'm not sure that it does not work. The line plugs 6 are heavier, of course. EDIT: Almost a few months of use I am impressed with the usability of this app. This is a treat, a real success. I put a. That's it. I usually work on Cubase. But I always liked the ease of Reason. I set up a small studio and was looking for a mobile software suitable for portable mobility and less powerful than my console fixed. Personally, I prefer to test an idea <em>quickly</em> or to explore a style of music, or go fast or play, have fun (yes that I still often). I do not see why a user of Reason happen this tool, and I see why a musicos (sic) could be seduced by the intuitive package that represents the duo props. But to make the sound engineer and mix or mastering a fortiori, it was said a hundred times, and it is obvious, it is not the appropriate yes!. But 20 years ago that would not have killed for a tool like this? Installation not too bad. the Uninstallation is another problem, all software additions to the dongle are grate and require several manipulations to transfer. Configuration etc ... We are faced with the propellerhead, so the problem of dongle set apart (and there are plenty, Cf their forum) it works. - Cable Internet is yes, and it takes a little time. A lot heavier in Reason, it is time to Get You Started. Not really. J'tait habitu a Reason to Get You Started quickly on the trane leg. - The table "formulation SSL" is ridiculous. SSL is a quality hardware. Have an accumulation of good hardware does not mean a lot. over the appearance of the table is very well, in real life. in virtual ca just take plenty of room for anything on the screen, and spends his time scroll. we love the game intgre compression remains, even if not used. - Organizing the window is searched. My first was RFLEX t "I need a troisime notch." 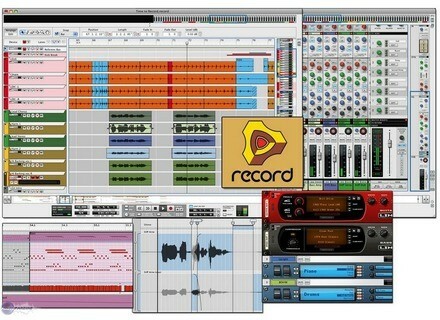 - The price: for a Reason user, you should invest in Reaper, more powerful and cheaper. - The algo change in tempo: bah it works. That said they are standard. no positive surprise here either. Reason in rewire to run offers more opportunities, not least, like using real effects, a more efficient interface and really taking into account the benefits of IT to deliver an interface plutt heavy d a large table, which therefore does not fit on one screen. I have tried many DAW before making my choice. in fact this product is not even a DAW. It is closer to the multitrack garage rocker button that its software. Installation on Mac is still easier. Product registration is not well explained very clearly but it is very easy to do and after 30 minutes of installation, on my deck with the DVD and my WiFi, I was already composing . However, a small bug was reported on a Mac version you must install a patch (see CodeMeter Update) but nothing serious. Hardware side, with my RME Multiface + HDSPe ExpressCard on Macbook Pro 15 "Mac OS 10.5.x nickel everything works except for one problem insert volume but is not due to record in my opinion. Performance-wise, I am very surprised with the result. However, this varies widely used equipment. But in my case, the CPU purring with 10 tracks (4 audio Mono + 6 Reason). I personally have not gone further but the demo songs that show it's solid. My RME is still as powerful and well configured with Reason, latency can barely 3ms. Which is very honorable for the components in the home studio. Reason I know from the 1.0 beta and I could see the evolution of the product. I dreamed then 8 years of this record! And here at last! I confess never to have loved using Rewire with Cubase or ProTools. I have a product all-in-one is perfect or stability, performance and quality nickel that I met my level of amateur home studio. There are so many opportunities to record that this product is the very heart of my Homestudio. The addition of ID8 very convenient and time stretch is super impressive. It's been two weeks that I played with and I've never been so creative! And a hop hop bass line and some guitar and hop add a battery ... The grip is so easy that I did not open the manual. (However I could use a little lesson in engineering because I still have a hard time with Compressors <img class="smiley" src="/images/audiofanzine/interface/smileys/icon_wink.gif" alt="" /> ). This purchase is for me to invest a musico amateur happy. I finally have everything I need in a box less than 500 €. Side money I think we can not find better. As Reason, no problem encountered. One small snag when it installs on a machine not studio, you need an ASIO driver, but it is and is configured without problem. No incompatibility meeting. I install a version of Windows 7 (I took a risk), and it runs beautifully. As with Reason, the setup is a breeze, the surfaces are well known and everything is "easy" and intuitive. For what I saw, again, like Reason, pdf manual is perfect, clear and qqs minutes on discovering new features. CM ASUS / AMD 64 Dual Core / 4GB / 500GB SATA HD, Sound Card intgre. Everything is stable, no bugs encountered so far. More than well. We can load the rack, effects and audio tracks to 10 without problem (I have not had the courage or inspiration to put for now). The Systm added component, however, slightly differ in Reason. Instead of finding the plugger lments on a table (it even component), the addition is done directly on a console. We will have a little trouble dpart to play with the effects or recover its cabling, but once the habit is absolutely gnial. The principle of multi-is no surprise (apart from the fact that it works really well trs trs ), But then the change in tempo of the recording is stunning. We all losses in memory of the old audio or soft, when you change the tempo, the recorded sound is distorted from the microphone - or so I rat many soft drinks, which can also , Here it is not. We end up playing rhythm guitar for example a 90 rear with a solo plan, some riffs. In one click, you find yourself in s'couter surdopp Satriani or Steve Vai ferrari version, and without any altration (in any case, I have not noticed yet). In conclusion, I found for myself that it is a complete ultra soft, and totally rejects the limits of the composition. A test of urgency.